LONDON, UK, 28 Wednesday January – The world can eat well, travel more, live in more comfortable homes, and meet international carbon reduction commitments according to the Global Calculator tool, a project led by the UK’s Department of Energy and Climate Change and co-funded by Climate-KIC. “The calculator clearly highlights that we can meet our 2°C target while maintaining good lifestyles – but we need to set ambitious targets on all fronts and use innovation to address climate change. 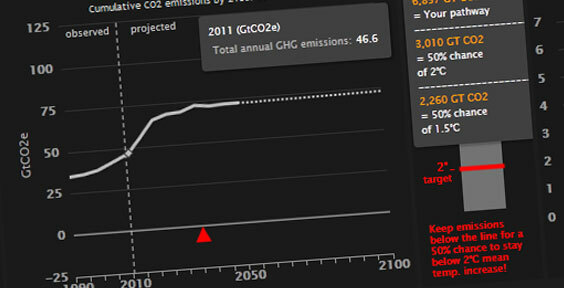 Using data reviewed by over 150 international experts, this free and interactive tool shows that despite expectations that the world’s population will rise from 7 billion currently to 10 billion by 2050, it is physically possible for everyone to have a good standard of living while limiting global temperature rises to 2°C. However, the tool shows that to be successful the world needs to act now and transform the technologies and fuels we use and make smarter use of our land for food, forestry and fuel. For example the amount of CO2 emitted per unit of electricity globally would need to fall by at least 90% and our forests protected and expanded by 5-15% by 2050. In 2010, DECC published the “UK 2050 Calculator”, a simple and transparent online tool that allows anyone to explore all the potential energy futures for the UK to 2050, and the impacts on energy security, costs, land use, air quality and emissions. 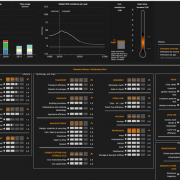 This tool was used to explore and communicate the options for the UK’s energy system to 2050, within the UK Government’s 2011 “Carbon Plan”. The UK Calculator has also proved useful outside government. For example, organisations such as Friends of the Earth and the National Grid have used it to better understand the choices and trade-offs facing the UK. China has been using their calculator to support the development of their government’s economic and energy strategy, and to train their officials on the energy challenges facing their country. The India tool has received support from the top of the Indian Government. For example, the then deputy chairman of the Indian Planning Commission stated, “I hope the India Energy Security Scenarios 2047 will help generate informed debate on energy policy issues”. Colombian officials spoke at the 20th Conference of Parties in Lima, in December 2014, about how they plan to use it to develop their Intended National Determined Contributions for emissions cuts. Vietnam are so keen on the approach that they are going to roll out the methodology at a provincial level in 2015. South Africa will be using their version of My2050 as part of a major national campaign to promote environmental education in schools, quoting at the launch event: “The tool will empower South Africans to make informed choices that contribute to a transition to a lower carbon economy and society”. The country-level calculator tools are very useful, however they cannot tell us what actions add up at a global level, and the risks we face if we do not take action to reduce global emissions. This is why DECC, with joint funding from Climate KIC, has led a range of global partners to build a global version. The Global Calculator was built by the UK’s Department of Energy and Climate Change, Climate-KIC, the International Energy Agency, the Energy Research Institute (China), the World Resources Institute, Ernst & Young, Imperial College London, London School of Economics, Potsdam Institute, Climact, Climate Media Factory, Rothamsted Research, Walker Institute, the UK National Environment Research Council, the UK National Oceanography Centre, the UK Met Office and Universite de Versailles St-Quentin-en-Yvelines. In addition, over 150 experts from around the world were consulted during the course of building the model. Find out more about the project at www.globalcalculator.org or find out the current level of CO2 in Earth’s atmosphere at co2.climate-kic.org and @CO2ThreatLevel.